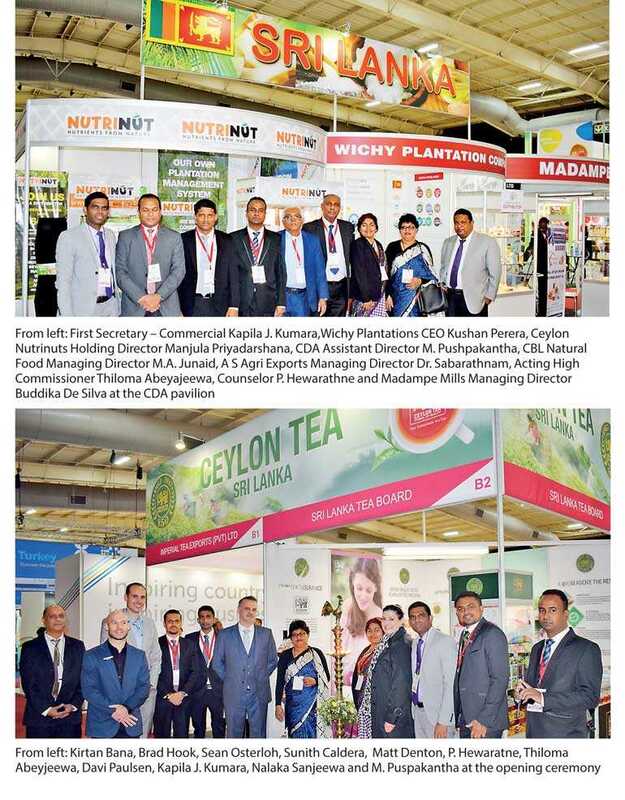 The Sri Lanka Tea Board and Coconut Development Authority (CDA) in coordination with Sri Lanka High Commission in Pretoria successfully participated at the Southern African International Trade Exhibition (SAITEX 2018), Africa’s largest product sourcing and trade event, held in Gallagher Convention Centre in Midrand, Johannesburg from 24 to 26 June. SAITEX provides an opportunity for exhibitors to network with buyers, distributors and other interested businesses in South Africa and in the region. A large number of exhibitors from the Southern African Region and from other countries were present at this year’s event. Imperial Tea Exports Ltd. exhibited its products under the Tea Board pavilion while five companies, namely Wichy Plantations Company Ltd., CBL Natural Food Ltd., Ceylon Nutrinuts Holding Ltd., Madampe Mills Ltd. and A S Agri Exports Ltd., showcased an assortment of coconut products under the CDA Pavilion at Africa’s Big Seven, the continent’s largest annual food and beverage industry trade event co-located with SAITEX. Samson International Plc also exhibited its high-quality rubber products as an individual exhibitor. The Sri Lanka Pavilion was declared open by Matt Denton, President of DMG Events – Middle East, Asia and Africa and Devi Paulsen – President of SAITEX, by lighting traditional oil lamp on 24 June. Thiloma Abeyjeewa, Acting High Commissioner, Brad Hook, Commercial Director of SAITEX and Kirtan Bana, Editor of the Diplomatic Society, were also among other dignitaries participated at the opening ceremony. The Ceylon Tea serving and promotional campaign were carried out at the pavilion by highlighting and showcasing the geographical branding, Ceylon Tea grades and its unique identity. The Sri Lankan exhibitors were highly satisfied with the firm inquiries received for its products from South African importers and distributors who visited SAITEX 2018. At the request of the High Commission, a delegate from the International Food Buying Department of Shoprite Checkers Group, Africa’s largest retail chain, had successful B2B meetings with all coconut exporters at the Sri Lanka Pavilion. Kapila J. Kumara, First Secretary – Commercial of the Sri Lanka High Commission in Pretoria, coordinated the Sri Lanka participation while Nalaka Sanjeewa, Market Analyst and M. Puspakantha, Assistant Director of the Sri Lanka Coconut Development Authority, assisted Sri Lankan participants throughout the event. The three-day event was successfully concluded on 26 June.